Home » Articles » Things To Do » This Is One BIG Musical! 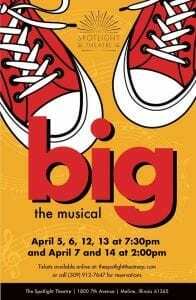 Big The Musical continues performances at The Spotlight Theatre (1800 7th Avenue Moline) on Friday Apr 12 at 7:30 p.m., Saturday Apr 13 at 7:30 p.m. and Sunday Apr 14 at 2 p.m.
Josh Baskin is sick of being an awkward kid. At a carnival, he makes a wish to the Zoltar machine to become “big.” To his shock, his wish is granted. After an understandably awkward beginning, Josh is forced to do “adult” things, like getting a job and a girlfriend. In the end, he discovers that there’s much more to being an adult than he bargained for and learns that we must all grow up at our own pace, in our own time. Tickets are just $20 and can be purchased online or by calling (309) 912-7647. Don’t miss these amazing performances!